The human oral cavity receives various types of food every day and part of such food remains at the tooth surface or the oral soft tissue. The human oral cavity thus has about 10 billion bacteria, and these bacteria form dental plaque, the main cause of various dental diseases, including the two major ones: dental caries and periodontal disease . Dental caries is a global oral health burden and is common in all ages. It is an infectious disease accompanied by tooth destruction. Streptococcus mutans (S. mutans) is a predominant contributor to tooth decay, and it is generally known that its significant action on early dental plaque formation is causing dental caries . Dental plaque is a biofilm of bacteria that adheres to the tooth surface. Schenkein et al. reported that bacteria make up about 70-80% of the dental plaque, and that cocci and fungi are mostly present in the early phase while spriochetes and vibrosis are present over the course of time . The oral cavity is a good environment for bacterial growth due to its appropriate temperature and humidity, and due to its abundant glycoprotein blocking the outside. Furthermore, dental plaque is an organic material that attaches to the tooth surface and that consists of microorganisms and its products, and cannot be removed by intraoral autopurification but only by using physical methods like brushing the teeth . The most commonly known dental plaque management method is brushing the teeth, and this is a general method of maintaining oral health and of preventing dental diseases. Brushing the teeth removes the dental plaque, food residue, and stain attached to the tooth surface, and adequately massages the periodontal tissue. Hence, it is the most important, basic, and effective method of preventing dental diseases, and of maintaining oral health . In addition, a significant association between dental caries infection of the tooth surface and bacterial contamination of the toothbrush has been reported . Therefore, proper toothbrush management is needed to manage dental plaque by brushing the teeth . Usually, people rinse their toothbrush using running water after brushing their teeth, and then store it. Kozai et al. reported that there is a difference in the level of bacterial contamination of the toothbrush according to whether it is rinsed after brushing the teeth or is not . Furthermore, Jeong et al. reported that the toothbrushes used at home have millions to billions of bacteria, which contaminate the oral cavity when used in brushing the teeth . Thus, people brush their teeth every day for dental health, but they are not aware of the bacteria remaining on their toothbrushes. Moreover, there has been no clear report on the differences in the number of bacteria present in toothbrushes by toothbrush storing method . Glass et al. emphasized that infection due to a contaminated toothbrush can be a risk factor not only for dental health but also for the general health , and Caudry et al. reported that toothbrush contamination increases the dental caries . Thus, appropriate toothbrush rinsing and an appropriate toothbrush storing method are needed based on these. Therefore, this study was conducted to promote awareness of the need for appropriate toothbrush management by comparing the numbers of bacteria present in the toothbrush when it is rinsed with cold water and when it is rinsed with hot water, and by analyzing the types and number of bacteria present in the toothbrush by toothbrush storing method. Fifty adult students enrolled at Kangwon University without any systemic disease or intraoral orthodontic appliance were randomly selected. To identify the differences in the number of bacteria present in their toothbrushes by toothbrush rinsing water temperature and toothbrush storing method, the subjects were instructed to brush their teeth after a meal for about 3 min, using a disposable toothbrush, then each toothbrush was collected and placed in a plastic bag. The subjects were divided into two groups, and each group was assigned to use sterile distilled water with a different temperature (hot vs. cold) for rinsing their toothbrushes after using these to brush their teeth, to identify the changes in the number of bacteria present in their toothbrushes according to the toothbrush rinsing water temperature. Group 1 used cold sterile distilled water (10°C), and group 2 used hot sterile distilled water (50.0°C). Each group used 20 ml distilled water sterilized right before the experiment according to the assigned temperature. To identify the changes in the number of bacteria according to the toothbrush storing method, each of the used toothbrushes was stored at one of the following locations: a sunny windowsill, indoors without a cap, or indoors with a cap. The mean temperature was 22°C, and the mean humidity was 50°C. The toothbrushes were stored for 24 h and were then used in the experiment. The subjects’ toothbrush heads were suspended in 20 ml hot or cold sterile distilled water before and after brushing, then were used in the experiment. To identify the types of microorganisms present in the toothbrushes, the suspended sterile distilled water that was used for rinsing the toothbrushes was observed using a phase microscope (ODOE-2222-TRIPLE, S-Denti Co., Seoul, South Korea) at 4300X magnification. Both the differences in the number of bacteria present in the toothbrushes by toothbrush rinsing water temperature and by toothbrush storing method were investigated. To measure the S. mutans activity, the suspended distilled water was cultured in Brain Heart Infusion (BHI) agar (BD Bioscience, Franklin Lakes, NJ) at 37°C for 24 h.
The statistical analysis was performed using IBM SPSS Ver. 19.0 (IBM Co., Armonk, NY, USA). A t-test was conducted to identify the changes in the mean number of bacteria present in the toothbrushes according to the toothbrush rinsing water temperature at a 0.05 significance level. As for the changes in the mean number of bacteria according to the toothbrush storing method, they were analysed through one-way ANOVA and Tukey’s post hoc test at a 0.05 significance level. 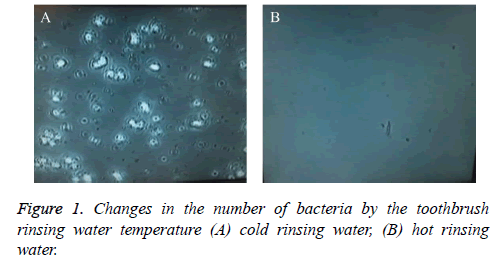 The changes in the number of bacteria present in the toothbrushes according to the toothbrush rinsing water temperature (cold vs. hot) observed via a phase microscope are presented in Figure 1. The number of bacteria significantly decreased when hot water was used for rinsing the toothbrushes (Table 1). *P-values are determined by t-test (p<0.05). Table 1: Difference in the number of bacteria according to the toothbrush rinsing water temperature. Figure 1: Changes in the number of bacteria by the toothbrush rinsing water temperature (A) cold rinsing water, (B) hot rinsing water. When the numbers of S. mutans present in the sterile distilled water cultured in BHI broth agar for 24 h where the subjects’ toothbrush heads had been suspended were determined, no significant difference was found between the values obtained before and after the suspension in the cold-water group (p>0.05), but a significant decrease was shown in the hot-water group (p<0.05). When the changes in the number of bacteria present in each toothbrush were observed using a phase microscope after storing each toothbrush in a sunny windowsill, indoors without a cap, or indoors with a cap, no bacteria were found in the toothbrushes that were stored at a sunny windowsill (Figure 2). Figure 2: Changes in the number of bacteria present in the toothbrushes by toothbrush storing method (A) sunny windowsill, (B) indoors without a cap, and (C) indoors with a cap. The differences in the number of S. mutans present in the toothbrushes by toothbrush storing method (sunny windowsill, indoors without a cap, or indoors with a cap) are presented in Table 2. There were no significant differences in the number of S. mutans present in the toothbrushes when these were stored under the same conditions (p>0.05), but there was a significant difference between the two groups after the toothbrushes were stored at different locations and under different conditions (p<0.05). The number of S. mutans present in the toothbrushes significantly decreased in the sunny windowsill group, followed by the “indoors with a cap” group and the “indoors without a cap” group, in that order. *P-values are determined by one-way ANOVA and Tukey’s post hoc test (p<0.05). Table 2: Difference in the number of bacteria according to the toothbrush storing method. Although today people use toothbrushes for oral hygiene and dental plaque management, they store their toothbrushes inappropriately because they are unaware of the importance of proper toothbrush management, and they repeatedly use contaminated toothbrushes . When a contaminated toothbrush is used repeatedly, various oral or systemic diseases can develop due to bacterial infection . It is reported that there are numerous bacteria attached to every day-use toothbrushes, and that the types and amounts of the remaining bacteria vary based on the environment of the toothbrush storing place . Caudry and Klitorinos reported that a mean of 4 × 103 CFU/ml bacteria were isolated from healthy adult toothbrushes . The people today have not been properly educated on the effective toothbrush storing method. Due to the changes in the housing environment, many people store their toothbrushes without sufficiently washing off the food residue; store them in the bathroom, where the toothbrush will not dry well; or store them with a cap in a sealed indoor environment . In addition, it is impossible to sterilize every day-use toothbrushes, and not many people use a toothbrush sterilizer to sterilize their toothbrush. Even though many people use toothbrushes for dental plaque management and dental health, there have been no studies on the differences in the number of bacteria present in toothbrushes by toothbrush rinsing water temperature or toothbrush storing method, and there have been limited studies on toothbrush management. Thus, this study was conducted to contribute to proper toothbrush management by determining the optimal temperature of the water to be used for rinsing a toothbrush for bacteria growth inhibition, as well as to identify a safe toothbrush storing method that reduces the number of bacteria present in the toothbrush. Based on the study results, motile S. mutans, which contributes to the activation of dental caries, was mostly found when the toothbrush bristles were observed. Once dental caries develops, it will progress . As such, mechanical methods like brushing the teeth must be used to remove dental plaque for dental caries prevention . Thus, brushing the teeth is a dental caries prevention method used by many people to decrease the dental-disease-causing bacteria in their teeth, and toothbrush management is considered important. The differences in the number of bacteria present in the subjects’ toothbrushes by toothbrush rinsing water temperature in this study showed that the bacterial death rate was higher in the hot-water group compared to the cold-water group. Furthermore, the results regarding the differences and changes in the number of bacteria present in the subjects’ toothbrushes by toothbrush storing method showed a significant decrease in the number of bacteria present in the toothbrushes in the sunny windowsill group, followed by the “indoors with a cap” group and the “indoors without a cap” group, in that order. Based on these study results, it was confirmed that rinsing a toothbrush using hot water and storing it at a sunny windowsill will definitely inhibit bacterial growth in the toothbrush bristles and is an effective way of managing toothbrushes. The report that E. coli was found in a toothbrush that was stored inside a toilet/bathroom highlights the importance of the toothbrush storing environment . Furthermore, it has been reported that the toothbrush washing method and drying time affect the bacterial growth in the toothbrush . Although Oh et al. reported that there were no significant differences in the number of bacteria among the bathroom, bag, desk drawer, pencil holder, and windowsill as toothbrush storing places in their study, it was concluded in this study that storing a toothbrush at a sunny windowsill will effectively reduce the number of bacteria present in the toothbrush. This study is expected to make known the seriousness of the bacterial contamination of toothbrushes, and to emphasize the importance of the toothbrush storing place, making it a standard for the appropriate toothbrush management method. To prevent dental diseases, including dental caries, the effective management of bacteria-contaminated toothbrushes is important. The most effective method of managing a toothbrush is washing it with hot water after use, and then storing it at a sunny place. This method is recommended as an excellent method of inhibiting bacterial growth and decreasing the bacteria in the toothbrush. Hamada N, Takehara T. Virulence factors of Streptococcus mutans and dental caries prevention. J Dent Res 1984; 63: 407-411. Schenkein HA1, Burmeister JA, Koertge TE, Brooks CN, Best AM. The influence of race and gender on periodontal microflora. J Periodontol 1993; 64: 292-296. Bergenholtz A, Gustafsson LB, Segerlund N, Hagberg C, Ostby N. Role of brushing technique and toothbrush design in plaque removal. Scand J Dent Res 1984; 92: 344-351. Dahlen G, Lindhe J, Sato K, Hanamura H, Okamoto H. The effect of supragingival plaque control on the subgingival microbiota in subjects with periodontal disease. J Clin Periodontol 1992; 19: 802-809. Lee MO. Bacteriological contamination of toothbrushes by dental plaque acidogenicity and related behaviors to toothbrush use. J Dent Hyg Sci 2004; 4: 255-263. Kozai K, Iwai T, Miura K. Residual contamination of toothbrushes by microorganisms. ASDC J Dent Child 1989; 56: 201-204. Jeong YK, Seong YR, Cho KS, Seong HK, Kim JB. Bacteriological contamination of home toothbrushes and hygiene improvement. J Korean Acad Oral Health 1992; 16: 15-17. Ji YJ. Toothbrush sterilizing effects of using microwave. J Korean Soc Dent Hyg 2012; 12: 641-646. Glass RT, Lare MM. Toothbrush contamination: a potential health risk? Quintessence Int 1986; 17: 39-42. Caudry SD, Klitorinos A, Chan EC. Contaminated toothbrushes and their disinfection. J Can Dent Assoc 1995; 61: 511-516. Bonten MJ, Hayden MK, Nathan C, van Voorhis J, Matushek M, Slaughter S, Rice T, Weinstein RA. Epidemiology of colonisation of patients and environment with vancomycinresistant enterococci. Lancet 1996; 348: 1615-1619. Loe H. Oral hygiene in the prevention of caries and periodontal disease. Int Dent J 2000; 50: 129-139. Karibasappa GN, Nagesh L, Sujatha BK. Assessment of microbial contamination of toothbrush head: an in vitro study. Indian J Dent Res 2011; 22: 2-5. Oh JH, Lee MR, Seo JH, Chang YS. Micro-organism according to storage method of the tooth-brush. Int J Clin Prev 2013; 9: 193-197.